TV advertisers imagine that one day soon you might see a product on screen — say Don Draper's whiskey glass or Daenerys Targaryen's dress—and pause the program, click on the product and then instantly purchase it. Relatively primitive versions of this technology already exist, but the idea is far from new. 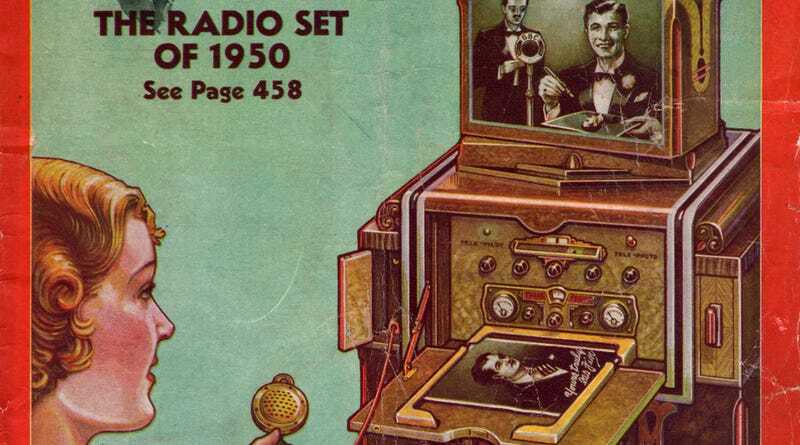 Long before most people had even seen a TV set, this type of instant-purchase tech for television was already being imagined in the "radio" of the future. A radio set that also included TV with a swivel head, instant newspapers printed right at home, and a telephone that could reach the family car. Unlike other early TV-developing countries, the United States embraced a commercial TV broadcasting model that was centered around advertising. But back in 1935, legendary sci-fi publisher Hugo Gernsback imagined a system for monetizing TV that wasn't solely dependent upon ads. Some inventors were experimenting with exciting new wireless fax technologies in the mid-1930s, and companies like RCA were even delivering newspapers via radiowaves directly into the homes of early adopters. Gernsback imagined that this same technology (however noisey and cumbersome it was in the 1930s) might one day allow for TV actors and musicians to send out autographed headshots or any other printed material, which would be printed right from your television. While you are looking at the artist on your television screen, the announcer will hand him a photograph, which he will autograph before your eyes. This photograph is then taken into the adjoining control room, where it is automatically transmitted on the same wavelength as that used by the broadcast station; and, in a few minutes, it will appear in front of your radio set in a slide provided for that purpose. The technical difficulties of doing this are but slight. It has already been demonstrated by several stations that television images can be sent out simultaneously with the sound impulses, over the same wavelength, without interfering with each other. The idea, therefore, of sending autographed photographs or other similar documents from the radio station to your own home and over your own set is, therefore, realizable even today. With certain refinements, the radio set of 1950, therefore, will not only be enabled to furnish you with your morning tabloid newspaper, giving you "spot" news information, but also autographed photographs and other memorable pictures that the enterprising station will wish to send out to its radio public. Some radio sets of the future that were imagined in the 1930s even had something akin to a "like" button, which allowed you to give broadcasters some feedback about the program you were listening to. But Gernsback's feedback mechanism was perhaps a little more old-fashioned. He thought that you'd be able to throw a switch and begin to applaud from the comfort of your own home. The amount of applause would be recorded by the radio station, and would help them decide what to play in the future. Gernsback described how a telephone of the future (built right into the radio set) might allow for people to communicate between home and car: "it would be possible for your wife sitting in your own home to pull out a microphone from a space provided in her radio set and, within a few minutes, be in communication with her husband who may be sitting in his automobile 20 miles away from home." I know that a lot of people will throw up their hands and howl at this suggestion. The cry will go up that the ether lanes are already so crowded and cluttered up with transmitters that even if we wanted, communication of this type would be useless; because no one would be able to understand anything. This is not true at all. I have had this idea in work for the past two years in Radio-Craft's sister publication Short Wave Craft, where the pros and cons of this idea of mine have figured in a discussion, hot and heavy. After all the smoke is clearing, the fact remains that below 6 meters, fortunately, you cannot transmit further than about about 20 miles. In general, that means that you cannot go much beyond the horizon. Thus, for a certain area, there will be far less congestion even than there is today; because on a few dozen frequencies, assigned for each district, with an automatic frequency lock on your radio set, there could not be too much congestion. It will, therefore, become a rather simple thing to converse by means of your own set with your friends a few miles distant. This will be especially useful for communication in outlying districts; such as on farms, between houses, automobiles, motorboats, yachts, and many other applications, not to forget private airplanes, of which there will be many in 1950. In case of accident, for instance, on the road, automobile, by means of transceivers, can quickly summon aid. The same is true of motor boats and airplanes. A world of private airplanes circling in the skies of 1950? Even while addressing skeptics, Gernsback was the consummate future-troll, constantly upping the ante to anyone who dared say it couldn't be done. As Gernsback saw it, one of the largest problems facing the TV of the future was in the ability for the entire family to watch it. The sound of radio could fill an entire room, so how might the family of the future enjoy this new technology of TV in a similar communal way? The TV screen was far too small, so the only solution as Gernsback saw it, was to make the picture swivel on the top of the set. If the radio set stands against the center of a wall for instance, then the person who sits in a chair near the same wall cannot possibly see the television image, and he has to move around in order to see the image. For that reason, the television-equipped radio set of 1950 will have the television screen in a compact box or case which can be swiveled on top of the set, in such a manner that the screen can be made to face anyone anywhere in the room. To obtain this result, the television apparatus proper must be on top of a cabinet where it can rotate freely through 360 degrees. When the radio set is not in use, means can be provided to disguise the television screen as a decorative picture or what not to harmonize with the decorations of the room. Incredibly, many of these ideas could've been called failed predictions just a few short decades ago. Newspapers delivered right to your home without the need for a paperboy? Hogwash in his target-dated year of 1950. Interactive TV that allowed you to purchase products with little more than a push of the button? Still a sci-fi dream in 1950. And in some ways, still a dream here in 2013. Instant autographs may be still just over the horizon, but once Beliebers get ahold of this technology, there's no telling what dark dystopia may lie ahead.